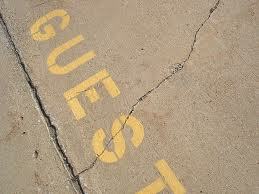 Guest bloggers get a direct search engine friendly (read dofollow) backlink from your blog. As a dofollow links mean that you trust a website, Google and other search engines are likely to penalize your website if you link to spammy pages or pages created solely for the purpose of generating sales. Guest Posts can be unrelated to your blog's niche. This could not only frustrate your subscribers but also make Google think that your website is a content farm. This is certainly not what you wish Google to think about your website especially after the dreaded Google Farmer aka Panda Update. Extremely short guest posts could mean addition of low quality pages (read thin content) on your website. This would reduce the overall quality of your blog for both human readers and search engine bots. Guest Posts could annoy your regular readers. Regular visitors of your website visit because they like your opinions and wish to read more from you, not from some stranger who they hardly know or have any information about. Guest Blogging could actually lower the number of subscribers on your blog. This is basically a result of the previous two points. When your subscribers find that you provide irrelevant updates, they would undoubtedly wish to unsubscribe themselves from your blog. Some guest authors copy content from other websites. If you are not able to discover it and publish their submissions, you further risk annoying readers who might know the original source of those posts. This could also result in search engines lowering your rankings for high traffic keywords as a result of the duplicate content effect. Some guest authors take your blog up for granted and often submit posts that are written with lack of attention and an uncaring attitude. This results in receiving useless submissions which lead to wastage of your time reading and sorting through them. Some guest authors write self promoting content with the aim of driving traffic to their websites. Hence, they deliberately try to make their articles less informative so that a reader must visit them in order to get full details. This again annoys your readers and results in low quality pages. What should you do with guest posts? Should you accept them or not? My recommendation would be that you should allow guest posting on your blog but, always take a close look at the author's website and make sure that it is worth a link. Moreover, set some quality standards for accepting articles and try to be professional in your decisions. Do not accept posts that you yourself do not like, after all your readers trust your opinions and that is the main reason they are reading your blog anyway. Thanks for posting this, never thought that guest blogging may also have a dark side. It is as they say, everything has its advantages and disadvantages. The same is true for accepting guest post submissions.